Whenever I begin to read a new book, I immediately look to the opening pages for a clear statement of purpose. Why did the author write this work? What sets it apart from others? When it comes to Andy Naselli’s How to Understand and Apply the New Testament, he wastes no time. Here are his opening sentences: “I love God, and I love studying his Word and his world. I wrote this book to help you study the New Testament, specifically how to do exegesis and theology.” That makes it plain. After I’ve found the statement of purpose, I look for the audience. For whom did the author write this book? As it happens, that’s where Naselli goes next—it’s for students, it’s for pastors and people with theological training, and it’s for thoughtful men and women who have little or no formal theological training. For the first group, it could be a textbook for a college or a seminary course on biblical interpretation. And, indeed, it had its genesis in a course Naselli prepared for Logos. For the second group, it might refresh and enhance their existing knowledge of how to understand and apply the New Testament. For the final group, it will be an introduction to the art and science of interpreting God’s Word. Once I’ve found the purpose and audience, I try to wrap my mind around the structure. How will the author lead the reader through the subject? In this case, Naselli offers twelve steps over the course of twelve chapters. But first, he introduces his subject by discussing exegesis, or drawing the meaning out of a text. “Exegesis interprets a text by analyzing what the author intended to communicate. 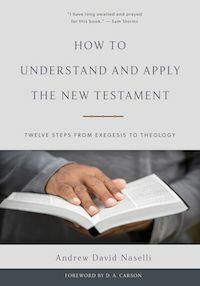 Exegesis is simply careful reading.” When it comes to exegeting the New Testament, this includes studying the original Greek, looking carefully at individual words, accounting for genre, and so on. “Exegetes are primarily concerned with interpreting a text, that is, discovering what the author meant.” Put simply, “The text means what the text’s author meant.” That is a simple and obvious way of saying it, yet so much of what passes for Bible teaching today reads meaning into the text instead of drawing meaning from it. That simple distinction makes all the difference. This may all sound very complicated and intimidating. At times it is. But the practice itself is familiar to all of us, for we all exegete every day. When we read the news or study books or skim emails, we do the work of finding the meaning of a text, of finding out what the author meant to communicate. We’re natural exegetes and need only to learn what makes exegeting the Bible different from exegeting other texts. Genre. Establish guidelines for interpreting the literary style of the passage. Textual criticism. Establish the original wording. Greek grammar. Understand how sentences communicate by words, phrases, and clauses. Argument diagram. Trace the logical argument using appropriate tools. Historical-cultural context. Understand the historical and cultural context in which the author wrote. Literary context. Understand the role a passage plays within its book. Word studies. Unpack key words, phrases, and concepts. Biblical theology. Study how this passage fits into God’s unfolding revelation. Historical theology. Consider how other theologians have understood the passage and the concepts it contains. Systematic theology. Learn how the theology of this passage accords with the theology revealed in the rest of the Bible. Practical theology. Apply the text to the teacher, students, and world. It is important to understand that these steps are more logical than chronological. The skilled theologian will know which to consider at length and which to consider briefly. He or she will also be able to perform many of them simultaneously. Yet each step plays an important role in the right understanding and careful application of each text. Through those twelve chapters, Naselli unpacks how to be a careful, skillful exegete. At least, he unpacks how he ensures he is a careful, skillful exegete. He pulls back the curtain on his own method in order to allow people to learn from and imitate him. This is not the one and only method to be a successful exegete. Rather, it is one theologian’s studied, thoughtful, proven method. Many months ago, Naselli asked if I would read his book, offer suggestions to improve it, and even pen an endorsement. As you look over the long list of endorsers just inside the front cover, you may spot a notable difference between most of the other people and me: while most of them are professors and scholars with academic pedigrees, I am just a guy with a blog. But I’m a guy with a blog who loves to read and loves to learn. I have found significant value in what I call ‘stretch reading’: reading that pushes me to the edge of my understanding and sometimes even a little beyond. This book was just such a stretch read but represented a challenge that I am glad I accepted. Naselli is one of my favorite authors because of the combination of his soundness as a theologian and his giftedness as a teacher. Both qualities are on bright display here as he encourages and equips readers to better appreciate, understand, interpret, apply, and teach the precious Word of God. Let this be a personal encouragement from me to you: Consider reading this book. Take the challenge and through it enjoy a deep, compelling, exciting look at God’s Book. Note also that How To Understand and Apply the New Testament has a fraternal twin, How To Understand and Apply the Old Testament by Jason DeRouchie. Though I haven’t yet read it, I do intend to.